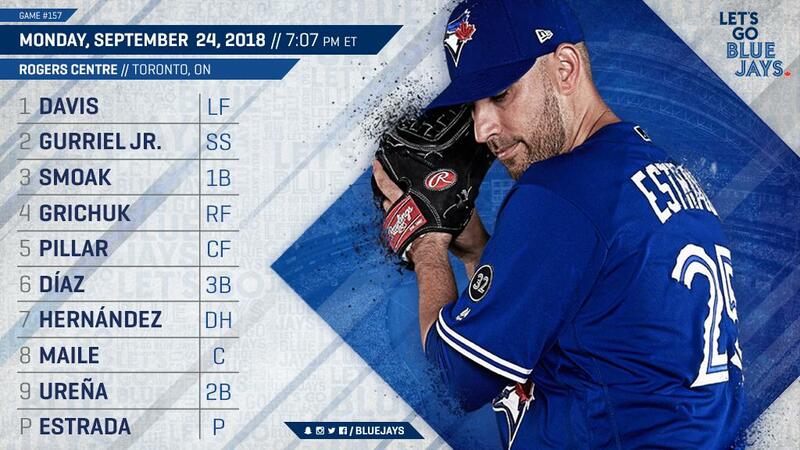 After a series split against the Tampa Bay Rays, the Blue Jays welcome the defending World Series champions Astros to Toronto for a three-game series. On the mound, Marco Estrada takes the ball as he attempts to stave off Father Time stealing what's left of his "fastball". Dallas Keuchel is his counterpart in tonight's matchup. the Gurriel brothers facing each other for the first time, and they seem to be gearing up for the matchup as they both hit 2 home runs last Friday to be the first brothers to do so on the same day. Roberto Osuna making his return to Toronto for the first time since he was traded away after serving a 75-game suspension for a domestic violence allegation. The boos could be rather loud. Ken Giles facing his old mates for the first time - wanna bet he'll be extra-amped with a couple ticks higher on the radar gun? the Astros looking to clinch a division title as they lead Oakland by 4.5 games with 7 games to play. and the Astros needing 2 wins to reach 100 for the season for the third time in franchise history. This is your "grab a bucket of popcorn and a six-pack, gonna be fun" game thread.